Napoleon Called Them "My Soldiers"
Whatever else may be said of the man, Napoleon cared deeply for his soldiers. He rode with them, fought with them, spoke to them from the heart, planted shade trees for them along the roads they had to march. Perhaps that loyalty that he felt for them was felt just as deeply on their side for him, and that may be why so many of you, Dear Readers, generations later, still write of your ancestor having been in "Napoleon's Army", of having "fought with Napoleon", and why you are so determined to prove that service. It is getting a great deal easier. 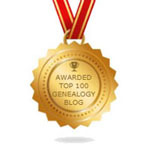 One really must praise the role that Geneanet is assuming in French genealogical research. If FamilySearch remains utterly bogged down in nothing more than French parish and civil registrations and Filae is at the forefront in increasing access to other French records such as census returns, the Bulletin des Lois and numerous collections that have already been indexed or extracted in some way, Geneanet is staking out the territory of deeper research, new scans of documents and collaborative indexing. The more interesting work can be found by clicking on "Projets" in the menu, then on "Autres projets" (Other projects). There, you can find Matricules Napoléoniens 1802-1815, the astonishingly ambitious project of indexing the entirety of the registres matricules (muster rolls) of the Imperial Guard and the infantry of the line from 1802 to 1815. The muster rolls have been available for some time on the website Mémoire des Hommes, as we explained here, but they are not indexed on that site. One must know the regiment of the person sought and then trawl through the many, many pages of muster rolls. The only other way to find this information has been to visit the relevant Departmental Archives and search through any surviving First Empire conscription lists. This indexing project, which has already indexed over 600,000 names and is headed by the rather intimidating Alain Brugeat, will transform Napoleonic military research, for it will break through the barrier of Departmental Archives isolation, (the research equivalent of a virus breaching the blood-brain barrier). Once complete, it will, in effect, provide an index that will link to images of the national, military, regimental muster rolls (on Mémoire des Hommes) as well as, in some cases, to the Departmental Archives' First Empire conscription lists (images digitized and held on Geneanet). Now, Geneanet just needs to upgrade its capacity for searching these muster rolls. At the moment, they can be searched by name only. For genealogists to be able to exploit this new resource fully, a much more sophisticated search must be possible. Kudos all round for this.